At the beginning of this season, I made a list of a few key things I wanted to add to my wardrobe for winter and I've slowly been ticking items off, thanks to a huge sell-off of lots of high heel boots and shoes as well as some older coats that I've not worn for a while. 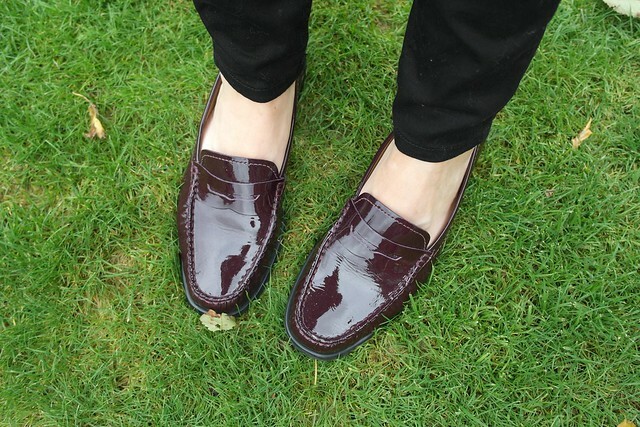 I have burgundy on the brain this season as you'll know from my last post and it just continues with these Burgundy Loafers from Van Dal at Gray & Osbourn. I spotted them when I was choosing items to feature on this last post and they kept calling to me thanks to those little google ads that pop up on your screen when you're on Facebook or Yahoo....annoying but effective in my case. 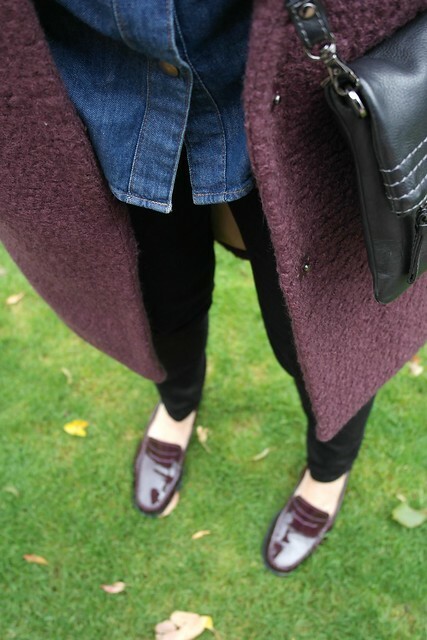 A burgundy coat was also on my list (coat obsession - I know) and I spotted an advert for Atterley Road a few weeks back telling me that all their coats had 20% off...so I went for a look. 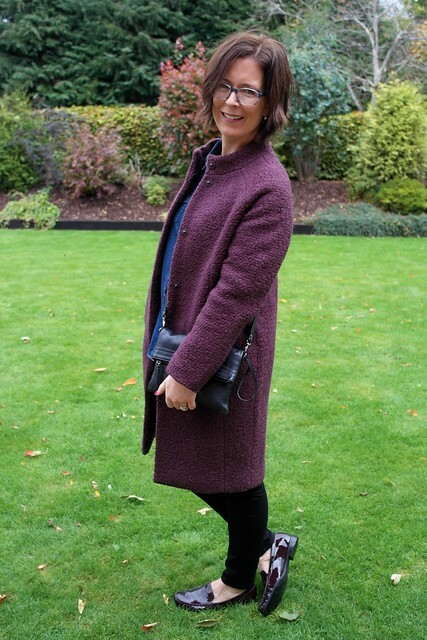 I couldn't find a burgundy one in the current season stock but on a whim, had a quick look at their sale stock and found this absolute beauty...it's called the 'Fun Coat' (??) from Selected Femme. Wool mix, longer length, half price, no brainer. And when I logged in to pay, it turned out I had Atterley Road loyalty points which took a further £6.50 off the price. Love it. I can't recommend both of these items enough. The shoes are the perfect trans-seasonal pair...more substantial than a pump for cooler days but storms or not, it's still mild this week - and wet, so these shoes are getting lots of wear. They are also very comfortable as you'd expect from Van Dal. Perfect for my wider foot (and the old bad back - which wasn't happy to have heels worn the night before these pictures). OK - I'm going to try to stop with the burgundy now....try that is...I can't help thinking how lovely the Clarks Cross Body Bag would look with this outfit. Loving the injection of burgundy Avril. Love that colour coat on you Avril... the shoes look great with the outfit! Wow, that coat is gorgeous, such a lovely colour! The loyalty points thing is a great idea - clothes shopping does pay after all! Love this coat Avril - it looks perfect on you so it was obviously meant to be. And guess what - I love the messy hair! Love the shoes & coat!!! 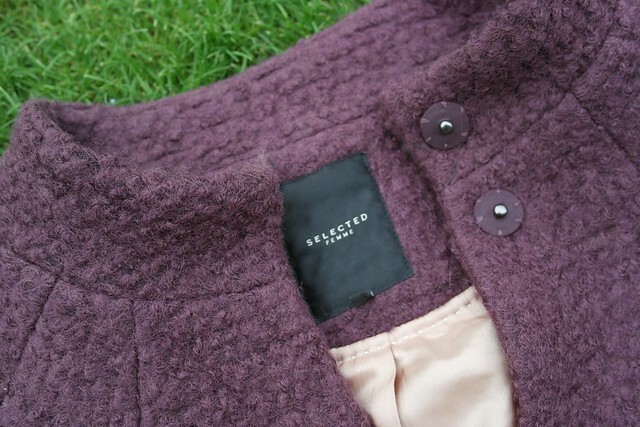 I adore this colour in the winter and what a bargain with the coat Avril. Great outfit and the shoes well they are fab, I must admit I would like a pair of traditional loafers myself they have been on my radar for a year or two and I always seem to buy something else, for silly some reason. Amazing amazing amazing - just amazing ! Oh my I love the coat. I'm a sucker for anything purple(-ish / purple-pink, purple-burgundy) - so much so that in recent years I've been on a purple buying ban! Wore my brown loafers today, even after two years they're still not fully broken in. 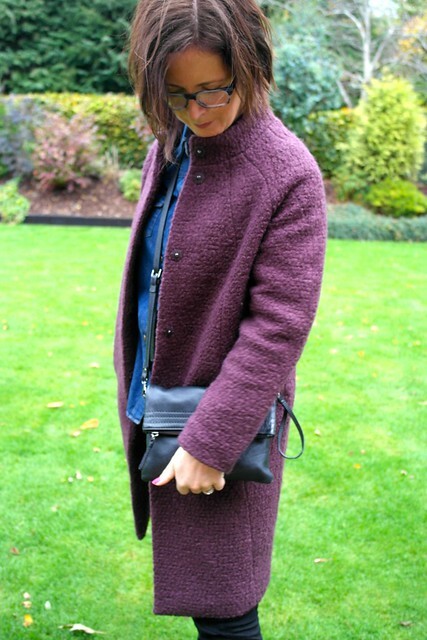 Lovely picks, I'm off to check out that coat....! Love the look. That coat looks lovely on you...just looked at the website and it looks terrible on there!